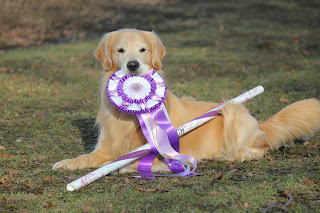 I'm new to agility, but have competed in obedience before as well as shown my horses. A good day to me is day where both my dog (or horse) and I had fun and did well. I don't count our level or even if we got a ribbon. All I want to do is end the day on a good note and see that my pup had fun too! That was a great post. Once when I first started agility, I was at a trial away from my home. My sister had come to watch me since the trial was close to her home. At the end of the day (very hot)I ran my two dogs with only one dog between them in an Advanced Jumpers. Two clean runs and two Q's. While my sister and I were packing up a guy came over and told me how great my runs were especially at the end of a hot day. My sister was amazed that agility people were like that and I've always remembered that compliment. Being new to agility with my first dog who is a non traditional breed - any kind word helps SO MUCH. It also sometimes feels (just like with any group) that it is hard to break into the agility club and make friends. I don't have a local training group to join and there aren't any people locally training agility, so I've met all my agility friends online. Hope you don't mind I posted a link to your post on my blog!